So, here I am in Kansas City. Beautiful hotel, ugly downtown scene. Sorry, I don’t much care for cities. As far as I’m concerned, the most attractive things visible out the tenth-floor window are the pigeons. Very odd to be traveling for work and not for a dog show. No dogs! I hardly know how to cope. Anyway: of course I brought my laptop. I won’t get anything actually done tonight because long drives leave me tired and headachy and in no mood for anything involving thought. I get up early, so morning before the seminar starts will be a much better time for me to work on the KERI — whoops, THE WYVERN KING — revision. No dogs to walk, how strange. My hermit tendencies are very evident under these circumstances. Instead of working on anything, I think I will read part of SAVING FRANCESCA by Melina Marchetta. I just read my first Marchetta novel, JELLICOE ROAD, and now I’m interested in reading more by her. I have FROI downstairs on my TBR pile, but of course I didn’t want to actually carry paper with me; that is what the Kindle is for. It was night by the time she drew near the village. She reined in Darkness on the last shoulder of the hill, leaning forward to pat his shaggy neck while she surveyed the valley. In the light of the full moon the river shown like tarnished silver, broken near the village where the millrace kept the ice from forming. A few lights glowed in the village, yellow against the pale snow. The large, brightly lit building in the village center would be the inn, offering the last rights of comradeship and hospitality before bedtime. Folk slept early in these mountain villages, and woke with the sun. Darkness turned his head inquiringly. His breath puffed clouds in the cold. She pulled the hood of her black talma over her head and tucked it around her throat, trying to remember the name of the village. Darkness moved down the slope. She’d already visited Helsrest, Marjoram, Three Crossings – this place would be the last, then back to Jentesi Castle. She wondered if Lord Gambin was dead yet. So, THE SWORD OF WINTER. This book was published in 1983. Wow, thirty-one years ago. Randall just didn’t ever write enough to become all that well known, I think: half a dozen or so books and that’s it. I see that her books are still available used and some are now available on Kindle, including several free with this new Kindle Unlimited thing Amazon has started. 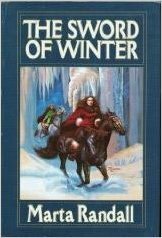 SWORD OF WINTER is my favorite Marta Randall title, and so far it seems only available as a used paper copy. So far I believe Elaine and Estara have read every one of the old books I’ve mentioned. How about this one? Anybody? Thirty-one years! That’s a long, long time in book years. Okay, so, in SWORD OF WINTER, we have Lyeth, who is a Rider, an official courier. And we have Lord Gambin, who is dying and who hasn’t named an heir, so as you can imagine this story is heavy on political intrigue. Gambin is quite a piece of work. He’s the sort who invents charming concepts like secret police and other general nastiness. Now here he is dying, which is fine, of course, except he’s keen to leave the country in a chaotic mess when he dies because that’s the kind of guy he is. So this is a story about Lyeth and various others trying to make sure it doesn’t come to that. But that would be boring if that was all it was. So, this is actually the story of Rider Lyeth and her relationship with Emris, a stray kid she picks up right at the beginning of the book, who wants to find his family; and with Torwyn, her lover that she’s not sure she can trust; and with Jandi, the guildmaster of the Riders. In other words, it’s a character-driven story, with themes of loyalty and trust that particularly appeal to me. Plus, Randall writes great dialogue – I love the bit when Lyeth and Emris dress up as prostitutes, for example, but there are lots of nice bits. I would quote that one here, but it’s more fun in context. We also get some great action scenes, particularly the scavenger hunt – a rose, a ring, a rock, a rhyme; a toad, a king, a dog, a chime. How about those items for a scavenger hunt, eh? The things Lyeth uses to fulfill the requirements are all clever, but my favorite is definitely the rhyme. But the best thing about this sequence is how Randall sweeps the reader through the whole scene in one rushing torrent of speed and also uses it to advance the plot; this is a scene to read the first time for fun, but the second time to see how she put it together and made it work. Very nice writing, truly. The plot flows smoothly from front to back, the ending is satisfying, the story is entirely self-contained, the writing is excellent, and the characterization is solid. If you like high fantasy with a good bit of adventure and even more political intrigue, then THE SWORD OF WINTER is a book you might want to consider picking up. Okay, now this I haven’t read yet ^^. Sad I can’t get it in ebook. Well, I guess eventually I was going to hit one you’d missed! It is good — hopefully you can pick it up used? Or possibly it will be put out in a ebook version one of these days, since some of hers have been. Yep, read it, and for some reason have had the scavenger hunt coming to mind a lot recently. It’s a good read, and I should fish it off the shelf. When bits of books start prodding my memory, the only way to stop them is to reread the source material. I really liked the bits I read while writing that post. I think I’ll re-read it from the beginning soon.